Shoo. Another awesome weekend :) This one was pretty busy (as always!). 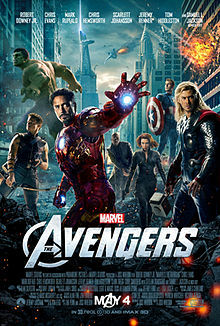 On Friday I headed straight to Cedar Square from work to meet The Trucker for the 5pm show of The Avengers. Shoo, okay so we watched it in 3D which wouldn't have been my first choice. I still don't like it, I don't like the glasses, I don't like that it costs so much more (and the glasses are extra! ), I don't like that I find things blur when they're moving too fast in 3D. But we didn't have a choice, Cedar Square only had the 3D version. I wonder what the stats are on who pick the 2D vs. the 3D option ... my preference would honestly be to scrap 3D entirely. I can't believe they are making TVs that do 3D too. Oh well. As has rather become my mantra at work: I am not the target market (I never seem to be?). And then we grabbed some sushi for dinner and were home before 9pm. Which was pretty perfect as I had to be up almost as early as a week-day morning on Saturday. I headed out early to get to Multiflora by 7:30am for a tour with Past Experiences. It was actually really cool! There is a whole industry going on there. 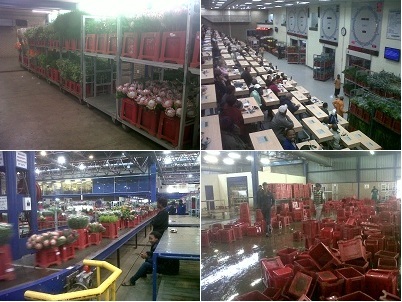 From pre-packaged flower delivery by the farmers to the giant freezers to the many many many flower trolleys to the bizarre auction room (we got to watch from a window - it's a silent auction and it is quite fascinating, must take a while to get the hang of being a flower buyer!!) to the very long conveyor belt of bought flowers. What a great insight into an industry I'd never given much thought to before! And afterwards @tfrayne and I went wandering in the mall, bought some flowers (I got 15 sunflowers for R60, which I thought was pretty good, and then some pot plants ... seems I just prefer those - haha) and had some breakfast at the Cafe Dulce there. I had a really nice breakfast with hash-browns (instead of toast) with poached eggs, avo & haloumi! After that I headed home, The Trucker had organised someone to come and sort out my outdoor lighting (that I've been trying to get done since December!) but he never showed up or answered his phone so The Trucker ended up doing it ... he'd already bought the bits. We didn't get very far before we had to head off to @Toxic_Mouse's 30th tho. It was an awesome and epic afternoon that lasted well into the evening with delish Ribs and plenty of alcohol (mostly Tipo Tinto Rhum & Sparberry). Let me just say it is not as much fun as you think being the sober-driver girlfriend - haha at least they were entertaining but I was exhausted by the time we left! Shoowee, the rest of the boys suffered on Sunday, I gather. The Trucker, despite probably consuming his body weight in alcohol (okay, that is a *huge* exaggeration) woke up perfectly fine, just a little dehydrated. The boy amazes me. He should definitely have suffered at least a little, but nope. At least he is still just as lovely when he is drunk (and this is the drunkest I've ever seen him! ), not angry or argumentative, just mellow and fun. We made home-topped pizzas (the bases were from woolies) for dinner (so good!!) 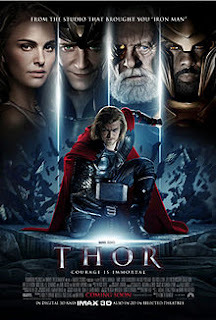 and watched Thor (since it was the one pre-Avengers movie we hadn't seen yet). What a yawn. Seriously. If it didn't lead up to the Avengers, I'd seriously be questioning why they bothered to make it.